Posted on Friday, August 29th, 2014 at 9:50 am. At Lower Hutt, stop for a peek at the Dowse Art Gallery, renowned for its edgy exhibitions and visionary collections. After lunch, you’ll continue along the trail to Upper Hutt, famous for the Trentham Military Camp and the Upper Hutt Posse, pioneers of New Zealand hip hop! It’s all aboard the old Wellington to Wairarapa railway line today. Easy riding awaits, since the track’s gradient is only around 1%. You’ll pass through Tunnel Gully Reserve and the northern tip of the bush-clad Rimutaka Range, before discovering the engineering ingenuity of the Fell mountain rail system, which pulled passengers up the steep slope of the Rimutaka Incline. Take in the spectacular views before enjoying a sweeping 6km downhill to the quiet country roads of the Wairarapa valley, and an easy 10km cruise to your night’s accommodation. Wild, dramatic coastline is on the cards for day three. You’ll wind your way along picturesque country roads to Palliser Bay, a vast sweep of black sand beach that’s home to one of New Zealand’s last remaining beam lighthouses. 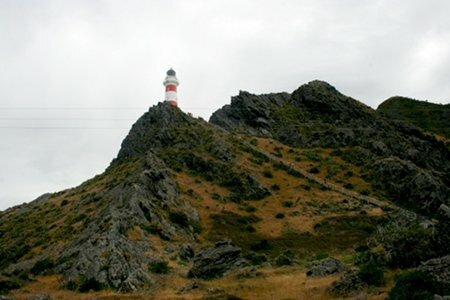 The jaunty, red and white stripes of the Cape Palliser Lighthouse earned it a place in Lonely Planet’s Top 10 ‘Flashiest Lighthouses,’ and you can climb the 253 steps to the top to enjoy grandstand views of the coast. The area is also home to some weird and wonderful geological features, such as the spooky rock formations of the Pūtangirua Pinnacles and Kupe’s Sail, a triangular ridge of rock above the road before the lighthouse. This region has a rich Maori history and evidence of an 800-year old settlement can still be seen amongst the landscape. Cleanse your palette and prepare to tantalise your tastebuds because today you’re discovering the vineyards of Martinborough! This picturesque village is home to around 20 wineries, all within easy cycling distance of each other. You’ll get to meet those in the know, stroll the vines and – of course – sample their wares. Enjoy a leisurely lunch at a winery café, before either cycling the 18kms to Greytown or catching a lift with the support vehicle. Greytown’s tree-lined streets are packed full of charm – the town boasts the most complete collection of Victorian architecture in the country as well as a great selection of boutiques, galleries, cafes, restaurants and gift shops. Your morning is free to discover more of Greytown: shopping, walking (there are several, interesting self-guided tours available from the Information Centre), a dip in the Greytown Swimming Baths or book in for a yoga or Pilates class with local Steve Impy. Transport can also be provided to visit Stonehenge Aotearoa – a modern, full-scale adaption of Stonehenge. After lunch, you’ll return by train (1.10 hour) to Wellington, where we can either take you on to the airport or to an inner-city hotel. 5 Day Wellington Harbour to Greytown Guided Cycle Tour, now booking for 20-24 November & 25-29 March. (22-26 January is already fully booked!) Find more info here. Book here.